Bangkok (VNA) – Two Vietnamese fishermen, who were in distress in the Gulf of Thailand, were brought to the homeland via air route, on March 17. The Vietnamese Embassy in Thailand coordinated with the host’s relevant agencies to help the victims return home. On March 9, fishermen Dand Tien and Huynh Van Thanh from southern Kien Giang and Ca Mau provinces, respectively, fell into the sea while catching fish. 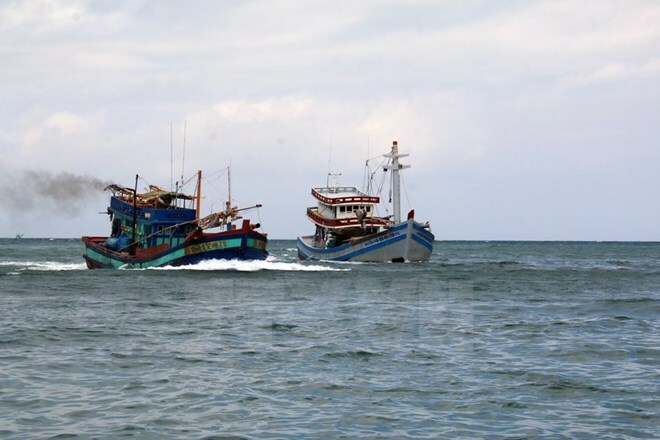 At 5:00 pm on March 10, a Philippine vessel discovered the two fishermen drifting on the waters of Thailand. Crewmembers brought the victims onboard and provided first aids. On March 12, the Philippine ship anchored at Laem Sabang port and sent the two fishermen to coast guard in Thailand’s Chonburi province. On March 15, First Secretary at the Vietnamese Embassy in Thailand Nguyen Hai Ngoc coordinated with the port’s police station to verify the case and conducted citizen protection.